The victory, Barnsley's eighth in nine league games, put them 10th in the table, seven points outside the play-off places, with Doncaster still 17th. Meanwhile, goalkeeper Christian Dibble has left Oakwell to join National League South club Chelmsford City. Match ends, Barnsley 1, Doncaster Rovers 0. Second Half ends, Barnsley 1, Doncaster Rovers 0. Adam Hammill (Barnsley) wins a free kick on the left wing. George Williams (Barnsley) wins a free kick in the defensive half. Cedric Evina (Doncaster Rovers) wins a free kick in the attacking half. Corner, Doncaster Rovers. Conceded by Josh Scowen. Attempt saved. Adam Hammill (Barnsley) right footed shot from outside the box is saved in the top right corner. Substitution, Doncaster Rovers. Lynden Gooch replaces Paul Keegan. Goal! Barnsley 1, Doncaster Rovers 0. Ashley Fletcher (Barnsley) right footed shot from the right side of the six yard box to the bottom right corner. Assisted by Conor Hourihane. Attempt saved. Sam Winnall (Barnsley) left footed shot from the left side of the box is saved in the bottom right corner. Foul by Alfie Mawson (Barnsley). Andy Williams (Doncaster Rovers) wins a free kick in the attacking half. Foul by Sam Winnall (Barnsley). Corner, Barnsley. Conceded by Cedric Evina. Alfie Mawson (Barnsley) wins a free kick in the defensive half. Attempt saved. Sam Winnall (Barnsley) header from the centre of the box is saved in the centre of the goal. Paul Keegan (Doncaster Rovers) wins a free kick in the defensive half. Attempt saved. Adam Hammill (Barnsley) right footed shot from outside the box is saved in the centre of the goal. Corner, Barnsley. Conceded by Paul Keegan. Corner, Barnsley. Conceded by Aaron Taylor-Sinclair. Attempt saved. Conor Hourihane (Barnsley) left footed shot from outside the box is saved in the top right corner. Attempt saved. 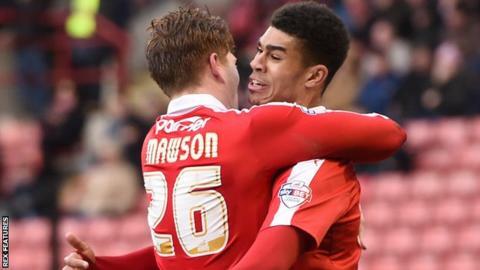 Ashley Fletcher (Barnsley) right footed shot from the right side of the box is saved in the centre of the goal. Adam Hammill (Barnsley) wins a free kick in the attacking half. Josh Scowen (Barnsley) wins a free kick in the attacking half. Substitution, Barnsley. Josh Scowen replaces Josh Brownhill. Substitution, Barnsley. Ashley Fletcher replaces Lloyd Isgrove. Corner, Doncaster Rovers. Conceded by James Bree.